The mighty Colorado River is a muddy vein of silt-rich water that tumbles precipitously out from the mountains of Colorado, through the arid deserts of Utah, into the endless labyrinth of canyons in Arizona and terminates in Mexico’s Gulf of California. Its previously untamed waters were the subject of legend and symbolized the life-blood of early civilization in the western United States. Explorers once believed the river could potentially serve as a massive inland waterway shipping lane from the Pacific to the Midwest. However, most did not realize (although a few brave souls found out) that the river was plagued with narrow corridors that spawned relentless whitewater rapids and hull-smashing boulders. Explorers like John Wesley Powell ultimately determined that the river was navigable, but only in very specialized vessels incapable of carrying large amounts of supplies. Since the days of Powell, the Colorado is a very different place. Through civil engineering projects like the Hoover and Glen Canyon Dams, the power of the river has been harnessed to produce billions of kilowatts of energy to power the large metropolises of the Southwest. As boating technology improved, the river became a major attraction for recreation. Guide companies and outfitters began setting up shop on the banks of the glorious waterway, touting grand adventure and adrenaline-pumping tours. So upon moving to Utah, I had to indulge in my own escapade and witness the excitement firsthand. Being novice boaters at the time, three friends and I set our sights on the stretch of river that runs near Moab, Utah. Most people know it as The Daily, mainly because it’s a short float (13 miles) that requires minimal preparation to undertake. We started our trip by stopping at a local outfitter to rent a boat. They recommended we choose between a nine-foot Mini Me and a slightly larger, more spacious craft. Thinking nine feet would be plenty of room for four men and a cooler; we strapped the boat to the top of our Toyota Prius. Even on a car that size, the boat looked small. No matter, we thought it would work so we cruised over to the gas station to fill our cooler with refreshing adult beverages. As we stood in the parking lot loading our libations with ice, a Forest Service vehicle pulled alongside us and inquired where we were headed. Upon telling the ranger our plan, she let out a disheartening “ha.” Taking one last look at our boat, she laughed again and wished us good luck. At that point we realized we needed a bigger boat. Luckily the shop let us exchange for a larger one and we were off. With our spirits lifted, we drove east to the put-in and started our great adventure. As we began, we admired the glistening red-rock cliffs that vaulted up from the river. Our first few rapids were exciting, but we wanted something bigger. We soon got our wish as we came upon a newer rapid that was created by a flood a few years earlier. The outfitter had warned us that a cavernous, boat-eating hole had formed on the river left at this flow and that it would behoove us to stay away. Paddling headlong into the maw we narrowly skirted the massive wave and were through the rapid. Along the way we collected some great pictures on my buddy Steve’s waterproof camera, who on the last rapid decided to ride the bow like a bucking bronco. Powering through the final bit of whitewater, Steve had a fantastic ride and we pulled over to take out. Unfortunately, the camera didn’t make it. Guess it wasn’t drop proof. After a few expletives, we piled into the car for the ride home. Although the evidence that we’d “conquered” the river was lost to its murky depths, we all knew it was a trip we’d always remember. 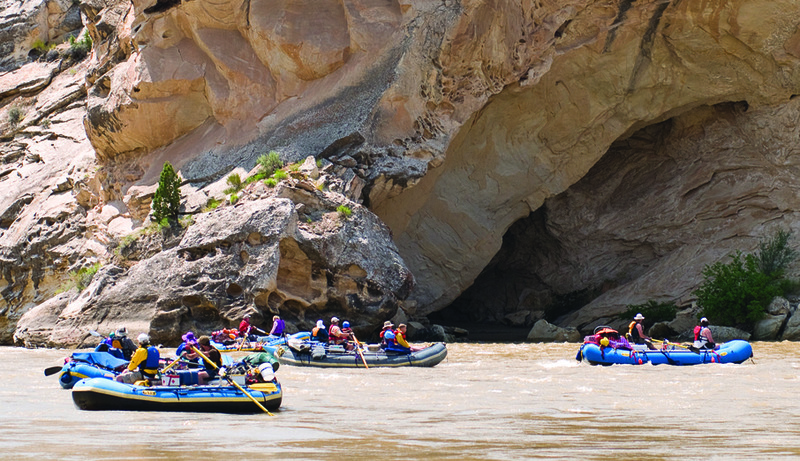 For those seeking their own unique river experience, a variety of rafting opportunities await the intrepid boater in and around Utah. If you and your crew are looking for a quick end of the summer trip, I recommend visiting the Moab Daily. It’s an enjoyable jaunt and you can even camp along Highway 128 and relive your moments on the river as you hang out by the fire. Or check out the abbreviated guide below to get you on your way to an epic voyage, no matter which river you choose.